It clearly has the typical purple glow to it, but it's more subtle compared to the use of only a blackight. Therefore I was wondering whether black lights are used (in combination with normal lights), do they use another kind of lights, or are most night scenes (digitally) edited afterwards? The scenes which we see in the movie as night scenes might not be filmed at night. Day for Night is a set of techniques is used to simulate a night scene while filming in daylight. These include tungsten-balanced rather than daylight-balanced film stock or special blue filters, under-exposing the shot (usually in post-production) to create the illusion of darkness or moonlight. Historically, infrared movie film was used to achieve an equivalent look with black-and-white film. On the screenshot you posted, we can see that it's actually filmed at night (dark sky, visible street lights). But as it's not enough for a film, a few additionnal lights are put on the set. Additionnaly, the blue filter is added in order to make it feel a bit more "like a real night". The sky has to be black. If its lit up at all, which happens in every day-for-night scene, the shot looks terrible. The shadows have to be BLACK. During daytime, shadows aren't black; they still have light that softly fills them in from the huge blue sky overhead. Since the nighttime sky is all black, the shadows aren't filled in at all, so a shot without sharp black shadows will (again) look terrible. The light in the scene is primarily a cool blue and there aren't many other colors. That can be achieved during shooting by putting gels over the lights or filters over the camera, or in post-production via color correction. 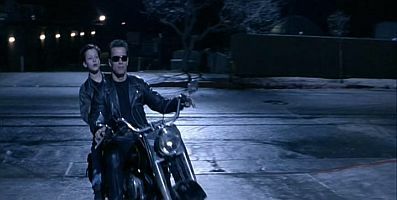 BTW, I was immediately thinking of Terminator 2 when I read your question and before seeing the photo from T2. The "nighttime" visuals in that were fantastic; the blue colors were perfect and the shadows were crisp. This is especially true when Arnold, Sarah and John are driving in the car with the lights off, after they've broken Sarah out of the mental hospital (45-50 minutes into the movie). Not the answer you're looking for? Browse other questions tagged film-techniques production lighting . Was Bane's dialogue spoken during filming or dubbed in during post? What if a head shaving scene gets messed up? Was there any notable pushback against “dark” (lack of lighting) cinematography? How did Game Night make shots that made the scene look like a model set?